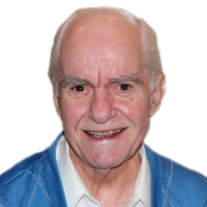 George Albert Parker passed away peacefully on Jan. 30, 2019 at the age of 92 from causes incident to age. George was born May 28, 1926 in Salt Lake City, UT to John David Parker and Ruth Cleveland Hudson Parker. He spent his early years in Salt Lake City and was educated in Salt Lake City schools. He graduated from West High School in 1944 and left the next day for the U.S. Navy, where he served for two years. In the Navy, due to his shorthand ability, he was assigned as a Reporter of Courts-Martial. He was “borrowed” on several occasions by the Army to serve in the same capacity. He received an honorable discharge from military service in May of 1946. After his discharge from the service he was asked by the Judge of the First Judicial District Court to come to Logan and temporarily serve as the Court Reporter until someone was available to fill the position full-time. He agreed to that and moved to Logan in June of 1946, where he served as the reporter “temporarily.” He retired from that job forty-one years and two months later. George met his sweetheart, RaNee Ballard, in 1947 when she came to work in the County Clerk’s office, where she eventually became the Clerk of the Court. They literally “courted” every day. They were married on November 25, 1947 in the Logan LDS temple and are the parents of five children, three girls and two boys. George enjoyed participant sports. He played for a short time with the Logan Collegians baseball team, bowled on several championship bowling teams, and was an avid golfer. In later years he especially enjoyed a weekly round of golf with his old golf buddies. In 1954 he and RaNee joined the Logan Jaycees organization. George eventually served as the President of the Logan Jaycees and RaNee served as President of the Jaycee Jills. George won the Distinguished Service Award in 1959 and was dubbed Logan’s outstanding young man for that year. George was a faithful member of the Church of Jesus Christ of Latter-day Saints and was always active in church affairs. He served in many positions over his lifetime, including Branch President and Bishop. He and RaNee were called to be temple officiators and served nine fulfilling years there. George is survived by his wife RaNee, and their five children: Susan (Brad) Beutler, Sandy, UT; Nancy (George) Winder, S. Jordan, UT; Bruce (Janet) Parker, Logan, UT; Lori (Michael) Lawrence, Taylorsville, UT; and Brian (Susan) Parker, N. Logan, UT; 19 grandchildren and 15 great-grandchildren, with 2 more on the way. He was preceded in death by 3 sisters and 5 brothers, and several siblings who died in infancy. A viewing will be held at Allen-Hall Mortuary, 34 E. Center St in Logan on Tuesday, Feb. 5th from 6:00 to 8:00 pm. Funeral services will be held at 11:00 am on Wednesday, Feb. 6th at the Cobblestone First Ward, 420 West 100 North in Providence, UT. There will be a viewing prior to the funeral from 9:30 to 10:30 am at the church. Interment with military honors will be in the Logan City Cemetery. Condolences may be shared with the family at www.allenmortuaries.com.